· Industry Night – Friday, April 6 from 5PM-11PM. Actors, directors, producers, agents and everyone else working in the Arizona film industry gather to rub elbows and exchange business cards during this FREE event. · Kids’ Day – Saturday, April 7 from 9 a.m.-2 p.m. Children of all ages the chance to learn about the art of film for FREE. Younger festival-goers can grab a movie poster to color or attend a crafts and story time event. Older film fans can try their hand at acting, editing and creating their own short films. These age-appropriate stations allow kids to explore the filmmaking process from beginning to end, and every part in between! · Festival Panel Discussions – Saturday, April 7 and Sunday, April 8 from 2:30 p.m.-6:30 p.m. Our FREE weekend educational filmmaker panel discussions are open to the public and designed to enhance your Festival experience by bringing together filmmakers, film lovers and industry professionals. · Geek Day – Sunday, April 8 from 1:30 p.m.-6:30 p.m. We know you love all things geeky! We do too! So come and gather with your like-minded friends for the 2018 Phoenix Film Festival Geek Day. Whether you love zombies, superheroes, comic books, cosplay, vampires, steampunk, Star Wars, anime or all of the above, Geek Day will cover it. 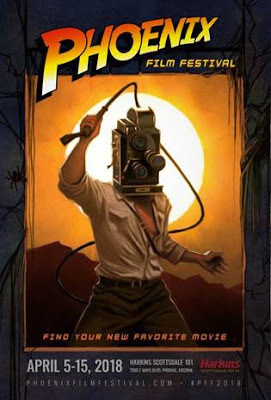 The 18th Annual Phoenix Film Festival will take place from Thursday, April 5 to Sunday, April 15. Continually breaking attendance records since its inception, last year’s festival saw over 25,000 attendees, and there are hopes to pull in even more film enthusiasts this year. The 11-day Festival will once again be held at Harkins Scottsdale 101 Theatre located at 7000 E. Mayo Blvd. Phoenix, AZ 85054.